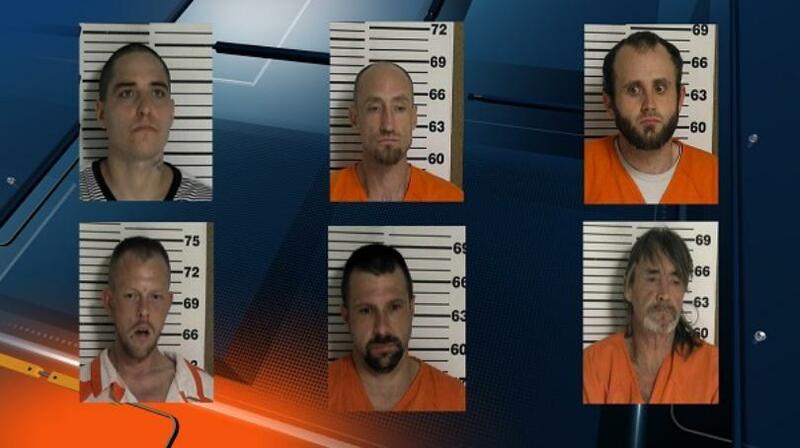 COCKE COUNTY, Tenn. -- Six men escaped from the Cocke County Jail Annex during the early morning hours of Christmas Day. Investigators said the inmates escaped through a hole behind a stainless steel toilet, CBS affiliate WVLT reports. Investigators said John Mark Speir was caught at a home in Cosby and Steven Lewis was captured after a foot chase in the Carson Springs Community. During Speir’s arrest, Daniel Speir and Jarred Schoondermark were charged with harboring a fugitive. The sheriff confirmed that two other inmates, Eric S. Click and Harce Wade Allen, were captured Monday. The Cocke County Sheriff’s Office said Allen was taken into custody by undercover narcotics officers. At 8:05 p.m. Monday, escaped inmate John Shehee turned himself in to Cocke County authorities. Investigators said his father helped deputies by coaxing Shehee to turn himself in. David Wayne Frazier is still unaccounted for.